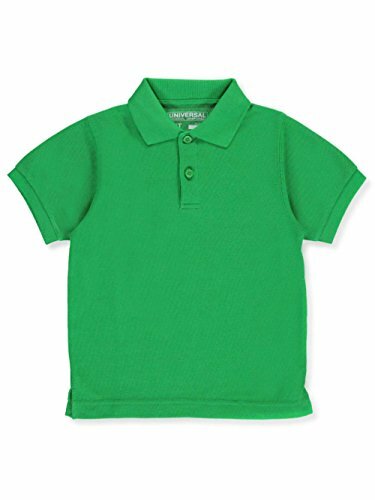 Universal Unisex S/S Pique Polo - kelly green, 6 by Universal School Uniforms at Our Lady of Sorrows Church. Hurry! Limited time offer. Offer valid only while supplies last. A CUT ABOVE CASUAL. With the comfort of a t-shirt and the classiness of nice, crisp collar, this cotton blend (60% cotton, 40% polyster) short sleeve polo shirt is great for everything from school, to church, to family gatherings, or to any other occasion that warrants a pulled together look. LOOKS GREAT & WEARS WELL. Made from a stain resistant material with a pique weave, tailored with reinforced stitching on the side seams, and boasting a three button placket, a ribbed collar and cuff, and a vented hem, this unisex polo is not only attractive and super durable, but it's also comfortable to wear. PERFECT FOR BOTH BOYS AND GIRLS. Available in unisex sizing and offered in a strong range of basic, pastel, and vibrant colors, this polo will boost the style of any child's wardrobe. SUPER EASY TO WEAR. From khakis, to jeans, to dress pants, to shorts, and to skirts, this polo shirt pairs well with practically anything. It's not just ideal for warm weather, either; it'll look fantastic worn beneath a sweater or jacket through autumn and winter, too. WASH AND WEAR. Machine washable and so versatile, timelessly stylish, and high in quality, this short-sleeved polo shirt is one you'll want to own in multiple colors. Machine wash cold on the gentle cycle with similar colors, tumble dry low, warm iron if needed. No chlorine bleach.